The Killing of the Innocents by Herod (detail), Leon Cogniet ca.1824. When our heaenly parents we meet! We shall sing in our home! O God, who for our redemption gave your only-begotten Son to the death of the cross, and by his glorious resurrection delivered us from the power of our enemy: Grant me so to die daily to sin, that I may evermore live with him in the joy of his resurrection; through Jesus Christ your Son our Lord, who lives and reigns with you and the Holy Spirit, one God, now and forever. May the God of hope fill me and all of us with the joy and peace that comes from believing, so that I may abound in hope, by the power of the Holy Spirit. therefore, behold, days are coming, declares the Lord, when . . . in this place I will make void the plans of Judah and Jerusalem, and will cause their people to fall by the sword before their enemies, and by the hand of those who seek their life. I will give their dead bodies for food to the birds of the air and to the beasts of the earth. When Herod saw that he had been fooled by the wise men he was furiously angry. He issued orders, and killed all the male children of two years and under in Bethlehem and the surrounding district — basing his calculation on his careful questioning of the wise men. ‘A voice was heard in Ramah, lamentation, weeping and great mourning, Rachel weeping for her children, refusing to be comforted, because they were no more’. Herod the Great was a bloody, odious, narcissistic and paranoid tyrant who murdered copiously at the sign of any threat to his position. He slew about 30 innocent babies in hopes of eliminating one who was prophesied to become a great king. His type is unfortunately common throughout history; in modern times, he must remind us of Josef Stalin, who like Herod would murder groups of thousands on the suspicion that a few of their members were his enemies. 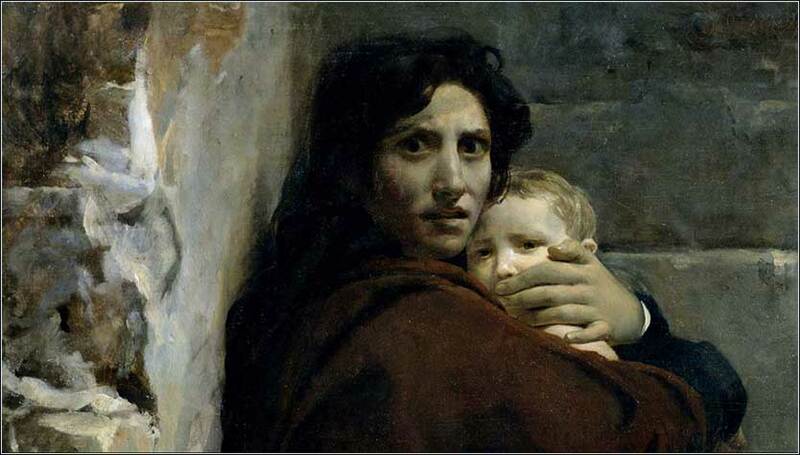 In describing the Massacre of the Innocents, as it is called, Matthew uses Jeremiah just as he used Hosea in the preceding verses. The quote from Jeremiah did not actually foretell the slaughter of children at the birth of the Messiah. It is not a direct prophesy of Christ and Matthew does not intend it as such. Rather, Matthew uses it to invoke a more general parallel between the Babylonian Captivity — the conquest of Israel by Babylonia, which destroyed the Temple of Solomon (the First Temple) and transported the Hebrews to Babylonia in slavery around 587 B.C. — and Christ's exit from Judea into Egypt. 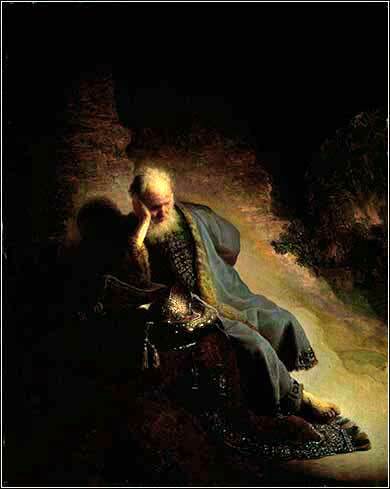 Jeremiah may be the most baleful prophet in the Old Testament, and looking at his life, one can understand why. His early years were spent in a period of great reform under King Josiah, where idols were smashed and a vibrant revival of the law occurred; but this lasted only as long as Josiah. Upon Josiah's death, Israel slipped into the wickedest idolatry imaginable. A horrifying Baal cult came into prominence: high altars, akin to those of Moloch, on which infants were sacrificed by roasting them alive. So Jeremiah lived through the downward spiral of the Hebrews, their conquest and enslavement by Babylonia, and the destruction of the First Temple. The quote from Jeremiah occurs as the Hebrews are being led in chains to Babylonia. They pass by the tomb of Rachel (who was buried at a place called Raman) and the children for whom she figuratively weeps are the Hebrews, “God's children”. Thus, Matthew ties Herod's massacre of infants to the practice of child sacrifice preceding the destruction of the First Temple by Babylonia. Judea under Herod, with the complicity of the Pharisees and Sadducees, has once again hit rock bottom. In the first case, God allowed Israel to be conquered and nearly destroyed. Pretend, for a second, that you know nothing of Christianity and have read the Bible from Genesis to Matthew 2; what would you expect God to do next? There is a hint: Yahweh, unlike Baal and Herod, not only allowed but also required that infants who were doomed to sacrifice be redeemed by the death of a lamb. (E.g., Exodus 13:13) But still, we should remember what an astonishing surprise ending Matthew has.